Great post. Summer smells for me are cut grass, Pimms and when you the scent of the sea. What's funny to me is that you used a photo of a peony. Every year when my peonies bloom, I think of the ones that grew in the alley next to the house where I grew up. On the last day of second grade, I took a bunch to my teacher. Now I bring my own fragrant bunches into the house — after shaking off whatever ants I can — and I remember her. This exercise made me realize that I associate summertime with water. Chlorine and bleach – smells associated with swimming pools. The smell of water forced through a garden hose, equal parts vinyl and metal, reminds me of running through the sprinklers in my grandmother's backyard as a child. The muggy, salty smell of rotten fish that you encounter on humid days near the ocean. This is very hard for me because almost everyday here is summer. I do know what you mean though and I'd have to say, hamburgers on the grill, but you already mentioned the grill and the smell of overripe peaches. Ocean air. Ahhh! And the sweetness of breathing in the scent of my daughters' still-sort-of-babyish scalp & hair. Precious. Adding sensory details to a memoir or piece of fiction makes a story come alive. Smell is one of the best to use, I think. My grandmother owned a small bakery when I was a small child, and to this day, when I think of my grandmother, I smell those marvelous yeasty, cinnamon scents in the bakery. A not so nice summer smell is kids who have been playing hard outside in the heat and come in all sweaty and dirty. — Mercurochrome (or merthiolate) as Mom painted bunnies on the skinned knees and elbows of the bike racers. Fi – yes, cut grass! It's my favorite smell in the world. Mikaela – citronella, definitely makes you think of those pesky mosquitos that are part of summer as well. 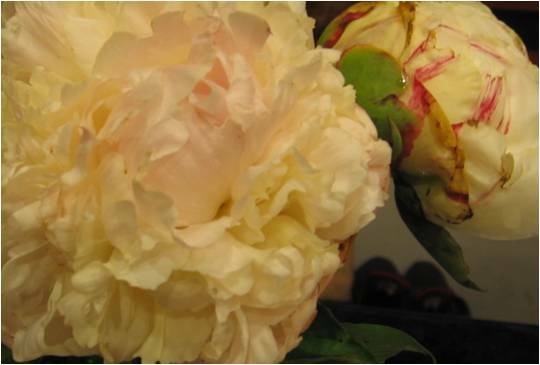 Tara – I guess peonies bloom earlier in warmer climates but here in Chicago they don't open until mid-June. Glad you like them as well. Alison – chlorine definitely! And you did a wonderful job of describing water from the garden hose, although for me that's more of a taste as we kids used to drink from it. Jenni – ocean air yes – that certain saltiness! Nancy – I, too, associate baking with my grandmother. Not so much the cinnamon, she wasn't big into that, but yeast is the ultimate grandmother smell. That and browned butter and grated lemon rind. Katyroo – thanks for your list of summer smells from your childhood. I especially love the precision of Mercurochrome!